Institute of Molecular Medicine, Martin-Luther-University Halle-Wittenberg, Halle, Germany. The RNA-binding protein HuD promotes neurogenesis and favors recovery from peripheral axon injury. HuD interacts with many mRNAs, altering both stability and translation efficiency. UV-crosslinking and analysis of cDNA (CRAC) generated a nucleotide resolution map of the HuD RNA interactome in motor neuron-like cells. HuD target sites were identified in 1304 mRNAs, predominantly in the 3’UTR, with enrichment for genes involved in protein synthesis and axonogenesis. HuD bound many mRNAs encoding mTORC1-responsive ribosomal proteins and translation factors. Altered HuD expression correlated with the translational efficiency of these mRNAs and overall protein synthesis, in a mTORC1-independent fashion. The predominant HuD target was the abundant, small non-coding RNA Y3, which represented 70% of HuD interaction signal. 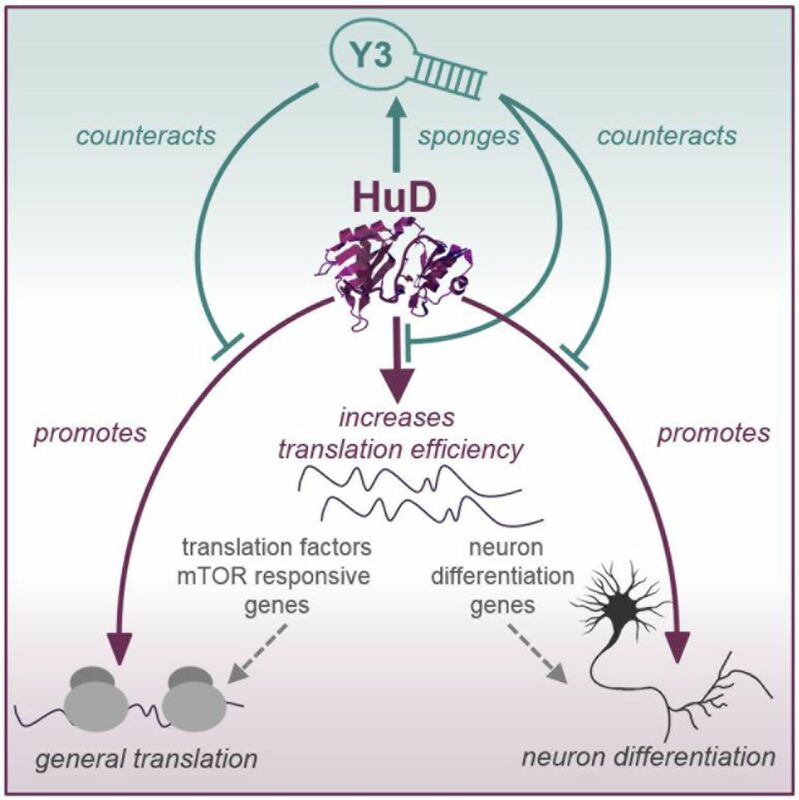 Y3 functions as a molecular sponge for HuD, dynamically limiting its activity. These findings uncover an alternative route to the mTORC1 pathway for translational control in motor neurons that is tunable by a small non-coding RNA.